San Jose, Calif. — San Jose State University is pleased to announce the establishment of the Mary E. McFadden Nursing Scholarship Fund, made possible by a $230,000 gift from the estate of the late Nancy E. McFadden, a San Jose State alumna and former chief of staff to Governor Jerry Brown. Single mother Mary McFadden raised her children, Nancy and Bill, while working nights as a registered nurse at the Kaiser Permanente Santa Clara hospital. Nancy completed degrees at San Jose State University and the University of Virginia School of Law before beginning a career in public service that included the Clinton administration in Washington, D.C., and the Davis and Brown administrations in Sacramento. In accordance with the gift agreement, the McFadden gift will fund a permanent endowment to provide scholarships for students with demonstrated financial need who are enrolled in San Jose State’s nursing program. The scholarship will be awarded annually to one or more students, thereby making a significant impact on their educations. Nancy Elizabeth McFadden was born in Wilmington, Delaware, the eldest child of William McFadden and the former Mary Adams. The couple divorced when Nancy was a child, and Nancy moved with her mother and brother to San Jose. Mary McFadden worked as a night nurse at Kaiser Santa Clara so that she could be available to her children, seeing them off to school in the morning and helping them after school through the early evening. Mary later became the night supervisor for the entire facility, and was beloved by her colleagues for her intelligence, sense of humor and practical nature. She worked until she was afflicted by a series of small strokes, passing away in 2000. “Nancy had the highest respect for nurses and believed that nursing is a special calling. It was her fervent desire that students who need assistance to become nurses be given a helping hand to achieve their professional dreams,” wrote the trustees for Nancy McFadden’s estate. 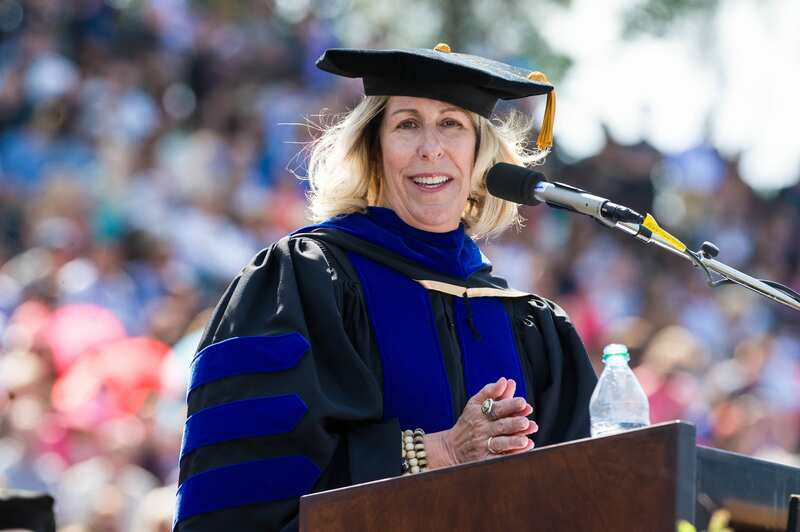 Nancy McFadden attended San Jose State, where she was elected student body president and graduated with a bachelor’s in political science in 1984. After earning her law degree, she devoted most of her career to public service. She was deputy political director for the Clinton campaign; deputy associate attorney general under Janet Reno; general counsel to the U.S. Department of Transportation; and deputy chief of staff for Vice President Al Gore. After returning to California, McFadden served as senior advisor to Governor Gray Davis and chief of staff to Governor Jerry Brown. McFadden counted among her greatest achievements spearheading a successful effort to extend the state’s extensive cap-and-trade program, setting a statewide limit on greenhouse-gas emissions. Her willingness to work for months and months behind the scenes to get things done was especially appreciated. Nancy McFadden died of ovarian cancer in March 2018 at age 59. 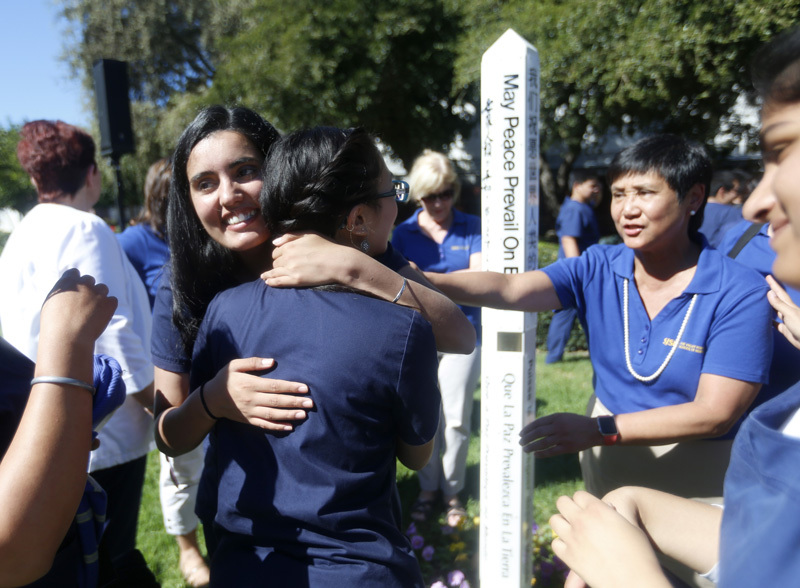 Inspired by her belief in world peace, a nursing student rallied the SJSU community to install and unveil its very own Peace Pole. Navpreet Kaur, ’17 Nursing, delivered the keynote address at the unveiling of SJSU’s newest monument Oct. 12. A crowd of students, faculty and staff gathered along a busy walkway between Tower Hall and a grove of trees and roses near Clark Hall to hear from her. “I believe we do have the potential to reach peace. It’s just a very difficult process,” she said. The Peace Pole is much smaller than SJSU’s Smith/Carlos sculpture and the Cesar E. Chavez monument, but it packs a punch. “May Peace Prevail on Earth” is inscribed on the pole in the 12 languages most common in Santa Clara County. Kaur was inspired to pursue the project after taking a semester off from San Jose State, and enrolling in classes at San Jose City College. She knew nothing about Peace Poles when she stumbled upon one there. The inscription, in so many languages, intrigued her. So she did what everyone does nowadays to record the moment: She took a photo of the pole, Instagrammed it, and then Googled it. Peacemarker by Leo Reynolds / Three photos, combined. She learned that the Peace Pole movement was born in post World War II Japan. Today, there are more than 200,000 poles worldwide. “I remember just feeling an instant connection, and I thought I wanted to see this on my home campus,” Kaur said. Back at SJSU, Kaur spent a day contacting everyone she could, from the president on down, until she got a reply. The response came from Aditya Mairal, ’17 Mechanical Engineering. At the time, he was the Associated Students director of intercultural affairs. “I gave her that push and told her that ‘yes, you can do this,’” Mairal said to Spartan Daily. Kaur took that to heart, and her dream came true, with a good dose of mentoring from The Valley Foundation School of Nursing Director Katherine Abriam-Yago. Raised in East San Jose’s cultural melting pot, Kaur was particularly concerned about the languages. “My number one goal was to make sure there was no bias with the language selection,” she said, so she turned to U.S. Census data to keep the peace. Interestingly, one reason she is drawn to nursing is, in her eyes, it’s also all about mediation. Originally published by the San Jose Mercury News July 6, 2011. The 8-year-old boy wasn’t going to get on a pink bike. No way, no how. And no amount of gender-correctness from older folks at a free bike-repair clinic the other day in San Jose was going to change his mind. But the bike was free, a hand-me-down from his sister, so Jesus shyly asked a bicycle mechanic whether he could make it look more, you know, like a boy’s bike. “When I heard that, my heart sank,” said Sue Runsvold, a nurse whose bicycle charity put on the free repair clinic. She gave the OK for a macho makeover. Off came the pink chain guard, rosy pedals and white tires. On went black ones. Although Jesus was happy with the results, the bike frame remained a pinkish purple. Six years after starting the nonprofit Turning Wheels for Kids, Runsvold has delivered about 11,000 bikes to needy children in Silicon Valley at Christmastime. That alone would put her on the road to sainthood in the eyes of many if she stopped there, but the nurse who manages a postsurgery unit at Santa Clara Valley Medical Center isn’t done. The follow-up counts just as much. By age 5, a third of all children in Santa Clara County are overweight or obese, according to a 2007 survey. That statistic jumps to almost half of all children by age 11. The prevalence of obesity at all ages is highest among Hispanic children, and lowest among Asian kids. Getting families to adopt healthier diets is one thing, but the doctors don’t have to lecture the kids to mount the bikes. They simply take off. All Barreto tells them is to include cycling in the 60 minutes of exercise they should do every day. The center hasn’t measured the direct health benefits from the biking, but Barreto is convinced it works. Her father, who drank too much and spent time in prison, wasn’t around much. Her mother, a secretary, simply couldn’t afford new bikes for her three kids. The years and decades flew by. The Runsvolds moved around the country, eventually settling in San Jose in 1994. She earned a nursing degree from San Jose State. Her children gave her grandchildren. Then her marriage collapsed, and so did the gratification of seeing wall-to-wall gifts under the Christmas tree. “I now saw opulence under the tree,” Runsvold said. She thought about her struggling mother, who accepted donated toys for her children at Christmastime and baked cookies as gifts for friends and relatives. Two weeks before Christmas 2002, she and a few friends raised enough money to buy 12 bikes from a toy store and gave them to San Jose firefighters to give to poor children. Runsvold and her friends gave away 40 bikes the second year. Word spread, volunteers signed on, and Turning Wheels was born. Bicycle manufacturers Raleigh and Dynacraft jumped on board with hefty discounts. Last Christmas, the charity raised $257,000 and gave away more than 2,000 bikes. It sounds as if Turning Wheels is cruising, but Runsvold said it’s still pedaling uphill. A new “Buck for a Bike” campaign hopes to raise the equivalent of $1 from everyone in Silicon Valley, to create an endowment of $1.7 million. That would give Turning Wheels a base income and allow it to think ahead and add educational and health programs. She doesn’t like being called director or chairwoman, but given Turning Wheels’ growth and popularity, Runsvold just might be creating a second career. Do you have a story for Eastside/Westside? Contact Joe Rodriguez at 408-920-5767 or jrodriguez@mercurynews.com. For more information or to make a donation, go to www.turningwheelsforkids.org. San Jose State is preparing to open its doors next year to nursing students seeking to earn the highest degree in academia: the doctorate. Marking a significant moment in the history of the California State University system, the university’s board of trustees voted Wednesday to create a doctorate in nursing practice, called a DNP, on several CSU campuses — including a joint nursing program at SJSU and Fresno State. For 40 years, California’s master plan for higher education has made doctorates the sole domain of the University of California. Then, a decade ago, CSU added one in education. And last year, it successfully petitioned for the right to award them in physical therapy at five campuses and nursing practice at three campuses. While the UC campuses will continue to offer doctor of philosophy, or Ph.D, degrees, which are primarily research-focused, CSU seeks to grant a more practice-focused advanced degree. “This is a real response to real need. It is important that we help meet the labor needs of the state,” said John Douglass, a senior research fellow at UC Berkeley’s Center for Studies in Higher Education. She did not outline how SJSU and Fresno State would collaborate in the pilot program. Before being finalized, the program needs professional accreditation and approval by the university’s chancellor. The U.S. Bureau of Health Professionals projects that California will have a severe shortfall of about 100,000 nurses in 10 years. The state already ranks last in the nation in the number of nurses per capita — 589 per 100,000 residents, compared with the U.S. average of 825. A big obstacle to closing this projected shortfall has been a limited number of slots available in California nursing programs — which is tied to a limited number of people qualified to serve as nursing faculty. But CSU’s advanced degree programs could pose new problems: funding, with a potential squeeze on undergraduates, said Judith E. Heiman of the Legislative Analyst’s Office in Sacramento. In the bills authorizing CSU to offer each of these degrees, the Legislature showed concern about these programs crowding out undergraduates. And it specified that each campus must fund the programs out of its existing budget. The California Nurses Association would prefer expansion of nursing programs at the bachelor’s and master’s level. The current nursing shortage has its roots in massive layoffs in the 1990s, she said, as the introduction of the “managed care” system shortened patient stays and reduced the need for nurses. And potential students disliked “the de-skilling of the work force, as RNs (registered nurses) were replaced by LVNs (licensed vocational nurses) and assistants,” Jacobs said. And work got harder, because patients in the hospital tended to be very sick. “Now, we’re in a catch-up mode,” she said, because of new laws that require more nurses, as well as the retiring of an aging work force. Despite plenty of eager and academically qualified candidates, Jacobs notes that there are not enough seats in schools to educate every student. The SJSU-Fresno State program, planned to start in the fall of 2012, will be one of three future DNP programs. A second jointly run program is planned by CSU campuses in Fullerton, Long Beach and Los Angeles. The third will be based in San Diego. A doctorate in physical therapy, planned for the summer of 2012, will be offered at CSU campuses in Fresno, Long Beach, Northridge, Sacramento and San Diego. Why are you a nursing student? We tracked down a handful of Spartan nursing students and asked why they decided to pursue a nursing career at San José State University. Check out what they had to say! A transcript of this video is also available.